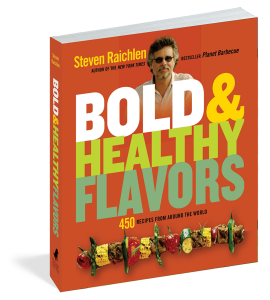 Bestselling and award-winning cookbook author, Steven Raichlen, has also spent more than a decade pioneering and perfecting healthy cooking. In Bold & Healthy Flavors Raichlen offers 450 easy-to-make dishes from Salmon with Yogurt-Tahini Sauce to Rack of Lamb with Indian Spices and from Chicken in Puebla-Style Mole to Polenta with Calabrian Sausage Sauce. Along the way he imparts low-fat cooking techniques like “bake-frying” and using herbs, spices, heart-healthy oils, citrus zests, stocks, and marinades to bring out the best in your food. The recipes represent all types of international cuisine including Mediterranean, Southwestern, Middle Eastern, Latin American, Indian, Asian, Greek, and more. Not a dull diet book, these recipes are delicious and full of fiery flavor, yet healthy enough to eat every day.